Israelis are among the most hated people on earth. We’re also among the happiest. This year, Haaretz reports, the Organization for Economic Cooperation and Development “examined quality of life among its 34 member countries, which includes Israel, and two nonmembers, Brazil and Russia. Its Better Life Index is based on 11 criteria: housing, income, labor market, community, civil engagement, education, health, environment, personal safety, balance between work and leisure, and an overall life satisfaction index. In another index, a researcher figured out which industrialized country has the lowest suicide rate and the highest birth rate which he calls the “Loving Life vs. Loving Death” index. 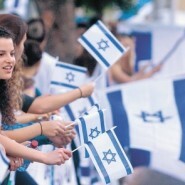 Among the industrial nations, Israel had the highest birth rate and the second lowest suicide rate–which he concludes means we are the happiest nation on earth. Israeli-Arab tensions. Religious-Secular tensions. Is-there-going-to-be-another-war tensions. Earning-enough-shekels-to-pay-your-rent tensions.